Bobby BlueJacket: The Tribe, The Joint, The Tulsa Underworld illuminates a neglected history of American crime, identity, and politics in the 20th century. This is the extraordinary true story of a man who went from career thief to prison journalist to Eastern Shawnee activist. Bobby BlueJacket is the extraordinary true story of a career thief who first gained notoriety as a convicted teenaged killer. Based on over 5 years of research, the book draws from BlueJacket’s own memories, long-buried law enforcement and trial records, prison archives, news accounts, as well as interviews with others such as photographer Larry Clark and veteran reporters of Tulsa's mid-century crime beat. Born in 1930, BlueJacket came of age as a Native American in white Oklahoma—passing through teenage rumbles, scheming pool halls, and Midwest safecracker crews. While incarcerated, he remade himself as a celebrated prison journalist. By the 1970s, he would act as a political impresario, used tire salesman, and prison rodeo emcee—ultimately becoming an Eastern Shawnee activist and respected tribal elder. At each turn, BlueJacket sought out success and self-definition by any means necessary. More than just an underworld tale—Bobby BlueJacket is an in-depth exploration of one man’s experience in a brutal post-war world. Bobby BlueJacket is illustrated with almost 90 photographs from never-before-seen personal archives, as well as images from prison publications and newspaper clippings. Left: BlueJacket in the U.S. Army, 1945. Right: BlueJacket arrested in 1948. BlueJacket at Oklahoma State Reformatory, 1951. 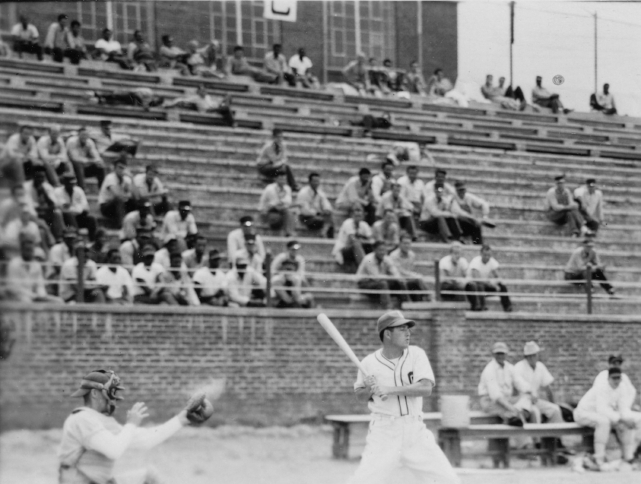 BlueJacket playing prison baseball, 1955. BlueJacket (left) with the "Outlaws" prison band, ca. 1965. BlueJacket's prison newspaper byline, 1966. BlueJacket working on a speech for the Eastern Shawnee council, 2014. Bobby BlueJacket came to my attention in 2012 through the photographer and filmmaker Larry Clark. I was then working with Clark on a history of his photography book Tulsa, which never materialized. The name BlueJacket was mentioned offhand in an unreleased 1968 audio recording, made by Clark, of some thieves and drug addicts. Clark told me that BlueJacket had once killed a star teen athlete and, back then, the man was a legend amongst Tulsans who considered themselves outsiders. After some cursory research, I found that little existed about BlueJacket online, except for an appellate court record that detailed the night in 1948 when he killed another boy. The court document, even in legalese, read like something out of S.E. Hinton. But when I actually met BlueJacket, I quickly realized that his story amounted to far more than a sensational murder trial—and that his prison sentence was anything but just. My interest in BlueJacket’s story is rooted in a belief that “everyday people” might better symbolize the triumphs and shortcomings of any given age. Powerful politicians, celebrities, financiers, and cultural giants have a greater effect on how laws, economic systems, and ideologies influence a society, but they do not necessarily embody what it was like to be alive for most people during a time and place. BlueJacket’s experiences illuminate the story of the United States in ways that a presidential biography, an institutional history, or a wider history of ideas could never achieve. His life is U.S. history as told by a street hustler, a criminal, a prisoner and prison journalist, a used tire salesman, an Oklahoman, and an Eastern Shawnee family man. Michael P. Daley writes about crime and cultural history. His previous books include Enjoy The Experience: Homemade Records 1958–1992, which was featured in BBC, NPR, Vice, Book Forum, Rolling Stone, and was called the greatest music book of the year by Los Angeles Magazine. He was founder/Editor of Parallax News, a digital news service for the 2016 U.S. Election. Michael was also a founding member of Boo-Hooray and Sinecure Books. He has worked on productions for Rizzoli, Four Corners, Zero Books, Brookings, and Warner Brothers.